How many purchasing decisions have you made that were influenced by what others say on social media? Raise of hands, please. Alright, you can count me in. 🙂 I like to think that I am an independent thinker, and I am, particularly on matters I consider as truly essential; but on matters that are not, it’s a different story. I often check online reviews on Yelp or ask my online friends what they think about something. Social media conversations on topics like books, coffee, travel, photography gears [the other business], dining, service, etc., help form my decisions for [future] purchases. Then there’s this movie that was rated rather low on a couple of review sites. I admit that we were very hesitant to see it but we did anyway. There were only a handful of people in the theater. Needless to say we were already bracing ourselves for yet another disappointment. To our surprise, that one turned out to better than the movie referenced above. 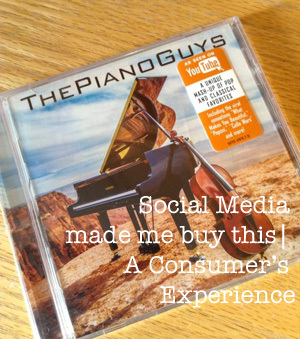 Lastly, I recently purchased the Piano Guys CD because of @LindaLSnell. I’ve seen them share YouTube posts on Facebook and swap tweets on Twitter about The Piano Guys. Honestly, I never heard of the group until I saw Linda and Amy sharing info about this group online. I have also queued up plenty of social media, SEO and photography books on Amazon because friends say that it’s a good read. 1. Social Media can sway a person’s decision to buy a product or a service. I have told myself to never get influenced by online conversations but I find the online “voice” too hard to ignore. There are many purchasing decisions that are made and shaped by social media. It is happening now. 2. Social media can influence other people’s perception of your product and business. Our hesitation about the second movie as mentioned above was formed by the reviews and ratings we checked online. It was that social sentiment that caused the trepidation. It was, overall, a good movie, but it just didn’t sell well with the social crowd for some reason. I have a hunch why but then that’s a different story. Respond to complaints and inquiries. Do not ignore them. Use the social media listening tools I indicated above. 3. Some purchasing decisions are made based on recommendations gathered from trusted relationships that have been built over the years. I checked my online friends’ opinion about the products/service I was buying because I trust them. You can add to this list. If you are already doing social media make sure that it is integrated and optimized for the success of your business. What purchasing decision have you made in the past that was influenced by social media? Join the conversation. Share your story!